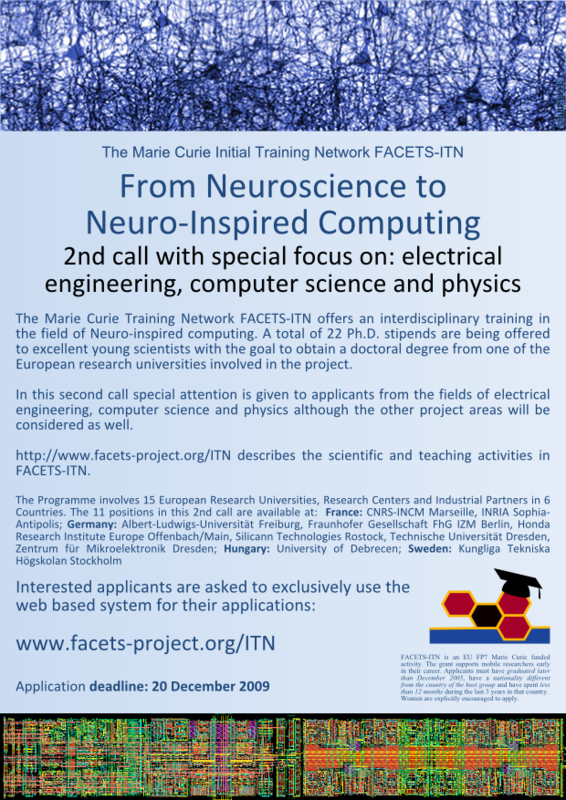 The FACETS ITN project (EU funding, grant number 237955) is a 'Marie-Curie Initial Training Network' involves 15 groups at European Research Universities, Research Centers and Industrial Partners in 6 countries. 22 Ph.D. Positions are funded in the FACETS-ITN project in the following scientific work areas: Neurobiology of Cells and Networks, Modelling of Neural Systems, Neuromorphic Hardware, Neuro-Electronic Interfaces, Computational Principles in Neural Architectures, Mechanisms of Learning and Plasticity. The FACETS research project which ended on 31 August 2010.